The Shielded Waste Container is a must-have item for any facility that generates low-energy gamma radiation waste. Constructed entirely of 18-gauge stainless steel and lined with .125" lead, this 20-quart container can be placed on the floor or counter. 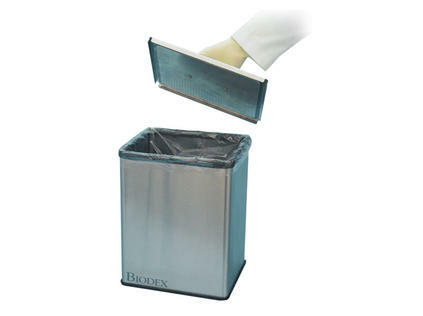 Simply lift off the shielded cover for quick disposal of waste. Plastic liners make it easy to transfer waste to a decay or disposal site once the container is filled.